Electric companies in Abilene are plentiful. Competitive rates and perks are right here on QuickElectricity.com. The following electricity plans are for the AEP North service area of Texas. Get bonus electric credits the more power you use! Did you know, prepaid electricity is actually cheaper than most energy plans? 100 days of free power! cheap electric rates during the week! no credit check or deposit required! NEW! Payless Electricity "Predictable 12""
12 month fixed rate prepaid power! secure a low rate and pay as you go without worry! save up to 20% off your electric bill yearly! Direct Energy "Green Texas 12"
This energy product is 100% green! First Choice Power "You Got This Green 12"
Support a green lifestyle at home! get a military discount on residential electricity! Direct Energy "Weekends on Command 24"
Free power on the weekends for two years! Lock in a low rate now! First Choice Power "You Got This 24"
Frontier Utilities "Frontier 24 Month"
Direct Energy "Power on Command 24"
Get a low, fixed energy rate for two years! Receive an Amazon Echo Dot free when you sign up! Veteran Energy "24 Month Partner Secure"
Ask how you can get a Nest at no additional cost. Who do I call if my power goes out in Abilene? If you live in the Abilene area and you have a power outage or electricity emergency, contact AEP North. 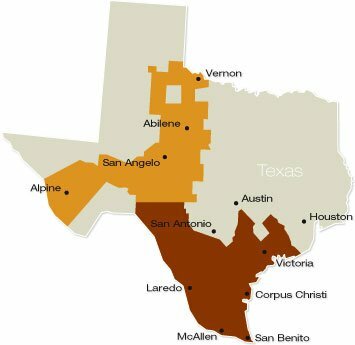 What are some electric companies in Abilene? Electric companies in Abilene include Payless Power, First Choice Power, Veteran Energy, Bounce Energy, Direct Energy and more! Quick Electricity offers a wide variety of pay-as-you-go electricity plans from the top prepaid electric providers in Texas.